Zipf's Law is a statement based on observation rather than theory. It is often true of a collection of instances of classes, e.g., occurrences of words in a document. It says that the frequency of occurrence of an instance of a class is roughly inversely proportional to the rank of that class in the frequency list. More exactly, suppose a word occurs f times and that in the list of word frequencies it has a certain rank, r. Then if Zipf's Law holds we have (for all words) f = a/rb where a and b are constants and b is close to 1. Taking the logarithm of each side of the equation we obtain log(f) = log(a) - b*log(r). (The log function can be to any base, such as e or 10.) Thus if Zipf's law holds of a particular collection then if we graph log(f) against log(r) the graph will be a straight line with slope close to -1. A consequence is that (if b = 1) a word of rank k occurs 1/kth as often as the most-frequently-occurring word. We see this from: f(k)/f(1) = (a/k)/(a/1) = 1/k. 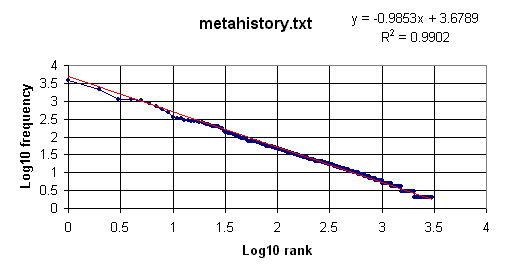 And for every k occurrences of a word of rank j there are approximately j occurrences of a word of rank k.
Since the Advanced Version (but not the basic version) will output a table of frequencies and ranks, it can be used (with the help of a spreadsheet such as Excel) to illustrate Zipf's Law, and to test particular collections of words as to how closely Zipf's law is true of them. Two examples will now be given. Start the program and in the 'Settings' window click on 'Restore defaults', then check/uncheck the checkboxes as shown at left. 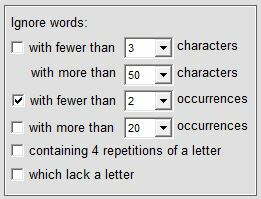 If a common words file is specified then clear the file name (this is so that the common words, such as 'of' and 'in' will be counted). 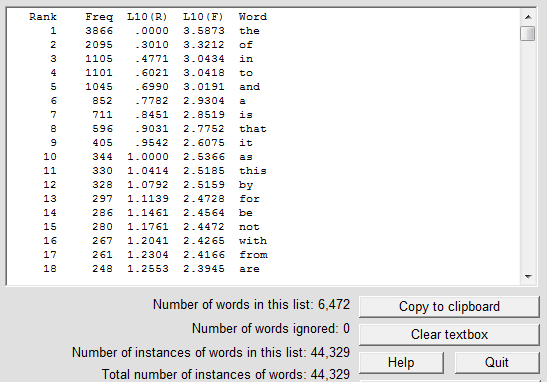 Select 'by frequency' for word order, and 'Zipf data' for display format. If the software has been activated then specify an output file, e.g. 'output.txt'. The L10(R) and L10(F) values are the logarithm (to the base 10) of the rank values and the frequency values respectively. The 615 "ignored" words are those that occur only once. 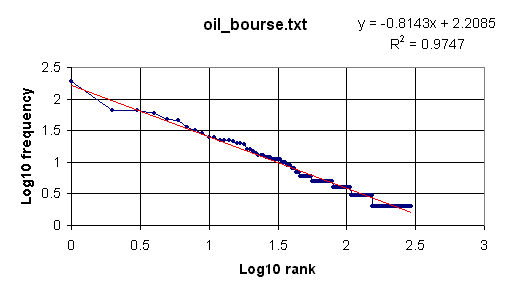 Clearly the log-log plot is roughly linear, confirming a Zipf distribution, although the slope is -0.8143, a little larger than the Zipfian ideal of -1. Here the linear fit is closer, and the slope, -0.9853, is much closer to -1, presumably because (assuming that natural language text does indeed tend to obey Zipf's law) the number of words, and the number of occurrences of words, in the second example are an order of magnitude larger than those in the first example, so there is less scope for random fluctuation from the ideal case. 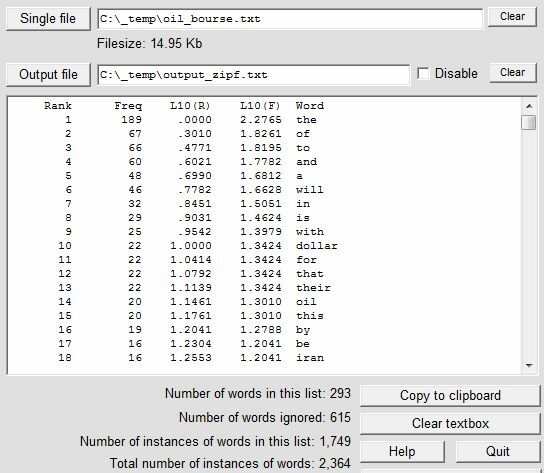 In contrast, a 2 MB file containing over 100,000 words randomly generated, although it produced a linear fit, did so with a slope of about -0.3, far from the Zipfian -1.